Truth ~ Pono In all that I do. 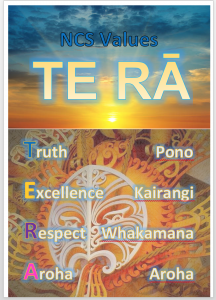 Excellence ~ Kairangi In reaching my goals. Respect ~ Whakamana Myself, Others and The Environment. At Newton Central School we believe in growing, enhancing and restoring relationships. We have developed a tailored framework that builds a culture where positive behaviour and learning is a way of life. It is an essential part of effective teaching and learning in our school and supports students to acquire and strengthen the key competencies that lie at the heart of The New Zealand Curriculum (Ministry of Education, 2007). This framework integrates our school’s vision and mission statements and core values with the curriculum key competencies.